Biggby Coffee is a Michigan-based coffee shop franchise with locations throughout the Midwest. They have a number of different coffee and non-coffee beverages, as well as a pleasant, upscale atmosphere. They also have a couple of bagel sandwiches. I sampled the Turkey Havarti bagel sandwich. Just as the name suggests, the sandwich consists of deli-style sliced turkey and a slice of Havarti cheese on a plain bagel. 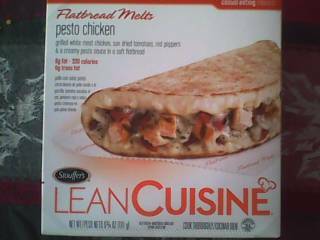 It was decent, better because I heated it up but not too remarkable. The Havarti was an interesting choice, but I feel it could’ve used a slice of tomato or a spread, something to make it a little more memorable. Still, Biggby is, first and foremost, a coffee shop, and if you enjoy their coffee and ambiance (which I do), the bagel sandwiches are a cheap snack. In other news, I have a couple more entries lined up, but I’ll probably wait a week or two to post them. The end of the year is generally a low-traffic period for blogs. Have a Merry Christmas and a Happy New Year!!! Sandwiches in Review: Great Steak and Potato Co. 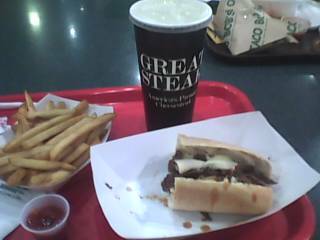 The Great Steak and Potato Company is a small franchise generally found in food courts and malls. As their name suggests, they specialize in cheesesteaks and various types of potatoes (usually french fried), although they do serve a couple other options. As a cheesesteak aficionado, I’m surprised I hadn’t thought to give them a try earlier. The Kansas City, in all its glory!!! I decided to try the Kansas City Cheesesteak, a variation on the usual theme presumably developed in Kansas City. It consisted of sliced steak, barbeque sauce, fried onions, and some kind of white cheese, possibly Monterey Jack (Great Steak & Potato Co. prides themselves on using Cheez Whiz, the way they do in Philadelphia, but I think they wanted to mix it up a bit for his sandwich). It was absolutely delicious. A lot of the quality was due to the fact that they fried it up in front of you, so it was unquestionably fresh. The steak and onions were of the highest quality, and the barbeque sauce was somewhat sweet, reminiscent of a Sloppy Joe. 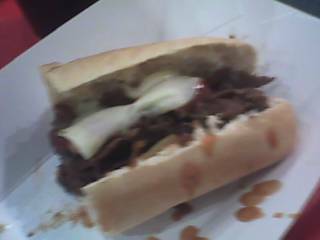 Overall, it was a high quality cheesesteak, both delicious and filling. The meal. 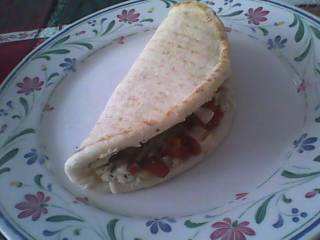 Well, most of it, I had eaten half the sandwich before I remembered to take the pictures. The meal came with French Fries (which had also been freshly prepared) and a fountain drink, all for about $6. It was a great meal at a great deal, and I hope to head back there soon to try another of their sandwiches. Sandwichtalk returns!! First of all, please excuse the impromptu hiatus. Sickness, computer trouble, and classwork all conspired to keep the blog down. However, I have a couple entries lined up for the next week or two, and I’m going to be much more diligent in my posting in the future. This is actually a quick update to let you know of another invaluable sandwich resource, The Cheese & Burger Society. I was introduced to this site by a friend of mine, and its practical uses are innumerable. The site in an index of pictures and recipes for different kinds of cheeseburgers, featuring a cornucopia of different ingredients. The recipes they list are inspired, and most look comparatively easy to make at home. Best of all, the entries are recited out loud by the spectacular Patrick Warburton, of Family Guy, Venture Bros., and Emperor’s New Groove fame. Click, and be inspired. P.S. Expect a Quiznos review by the end of the week, as well as a couple Dossier updates in the near future.